Now call me old-fashioned, but doesn’t that make three of the top five (and over US$300 million’s worth in one year) groups that have been around for well over 20 years each?? And in the last couple of years it was the Stones topping the bill – which decade are we in? Or more worryingly, why is none of the new music or any of the new new musicians up there? I discount people with silly names or dance routines or midriffs, obviously. Except maybe Iggy Pop, and his midriff’s showing a lot of mileage…. But possibly, just possibly, it’s because the acts that sell so well do so because they can actually play something, and write tunes and lyrics that genuinely stay with one for longer than it takes to play them. Which is why my son loves Queen, and now Deep Purple, and Led Zeppelin. 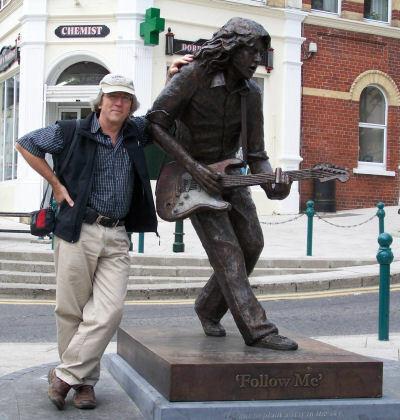 Cue “Bullfrog Blues” from “Live in Europe” from 1972 – and Rory Gallagher rides again…! Still making money for the family after being dead for 15 years, and now the inspiration for a festival in his birth town of Ballyshannon, Eire. Where, as of this year, you may find this tasteful statue of him in the main street, just opposite the funky little record store that carries his CDs. Where I was lucky enough to make pilgrimage, lo, this very June. Thanks, Meg! And thanks forever to someone known to me only as Big Crossley, for playing so much of Rory’s band Taste back in Senior Common Room, in 1972…. So cueing it up – and rock on, Rory! Laughin’ just to keep from crying. This entry was posted in Music and tagged Bruce Springsteen, classic rock, Rolling Stones, U2. Bookmark the permalink. 2 Responses to Grey hairs rock, OK?! Of course it was…B-) Damn fine record collection is what I remember mainly.